Mark Bell spent at least $2,700 on the recent moose-hunting season. By February, he had to give up on finding one. Mark bell stops his truck at the edge of town, where the bush road begins. Leaving the engine running, he grabs a cigarette from a pack of Putter’s on the dashboard and walks into the trees. After sprinkling out a bit of tobacco from the cigarette, an offering of thanks to the Creator, he lights the smoke. “That’s as traditional as I get,” says Bell. Determined to fill his freezer with food, he gets back in the truck and keeps driving into the predawn darkness. A band councillor at Aroland First Nation, part of the Nishnawbe Aski Nation, Bell lives in Nakina, Ontario, 341 kilometres northeast of Thunder Bay. Since last March, when the North West Company closed the Northern store in Nakina, the only groceries available in town are the selection of chocolate bars, chips, and shrink-wrapped sandwiches at the gas station. The closest supermarket is the No Frills in Geraldton, about forty-five minutes south—131 kilometres round trip. Bell hunts, fishes, and traps for much of his food. Moose is his primary source of meat, but it has been over a year since he killed one—a butcher processed it into 486 pounds of steaks, roasts, sausages, pepperettes, and ground meat, and it has lasted until now. If he sees a moose today and gets a clear shot, it will feed him, his wife, Siru Kantola, and daughter, Taiga, as well as his father, brother, and sister-in-law, for another year. It’s just past 6 a.m. on a Saturday near the end of October—already the middle of the moose-hunting season. Bell has heard from friends that moose have been spotted around here recently. Right away, he sees big hoofprints; some, he estimates, are only twenty minutes old. There are bare trees with broken branches from where moose rubbed their antlers to remove the “velvet”—the soft fuzz that nourishes the fast-growing bones while they regenerate every year. As the truck jostles along the bumpy road, Bell begins to see more tracks, then wolf markings mingled with the moose prints. Reaching a point in the trail impassable even in his heavy-duty pickup, Bell pulls a quad, an all-terrain vehicle, off the trailer. Slinging a bolt-action rifle over his shoulder, he pushes farther into the bush. 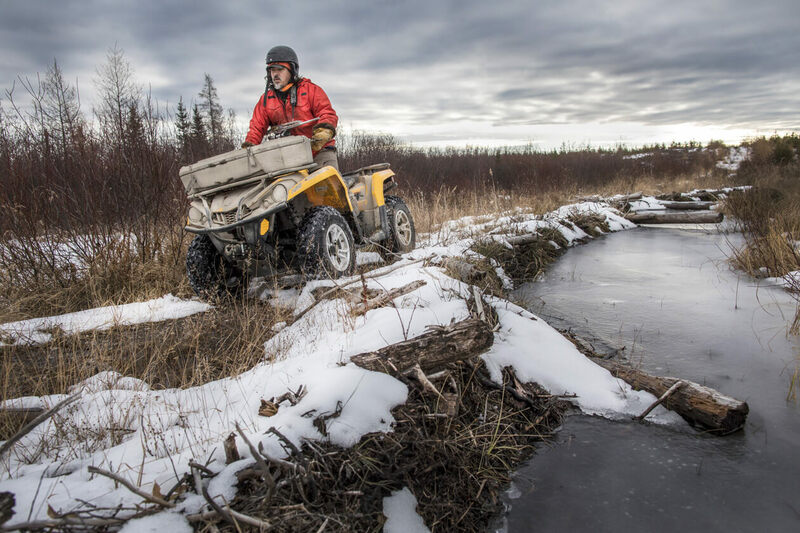 The quad bounces up and down as it traverses hills and valleys, charging over ice and through slush and mashing down vegetation. All the while, Bell swivels his head left and right, scanning the horizon for any sign of movement. But nothing moves. The birds have all flown south for the winter. There is little breeze, and the remaining trees have no leaves to sway. The landscape is silent, motionless, and to Bell, a vast, empty fridge. Bell is one of many Indigenous people who are privately and publicly engaged with the restoration of their food cultures, returning to a more traditional diet through activities like sustenance hunting—practices long under threat of eradication but not gone forever. Indigenous food sovereignty was decimated by design: the separation of people from their historic food systems and land is not a side effect of colonialism but a function of it. Canada’s formation is a history of legislating First Nations, Inuit, and Métis out of existence, including by erasing Indigenous food cultures: the Gradual Civilization Act, the banning of potlatch ceremonies, the signing of treaties that exchanged life-sustaining hunting grounds for farmland, livestock, and pitiful amounts of cash. All of it was designed with the purpose of elimination through assimilation. Catharine Parr Traill, who documented her experiences as an early nineteenth-century settler in Ontario in a series of books, describes Europeans thriving by adapting Indigenous food-preparation techniques, harvesting wild rice in the fall and maple syrup in the spring. Traill writes of a consistent exchange with the Hiawatha First Nation (then called the Mississauga Anishinaabe people); its baskets, mats, ducks, and venison were traded for settlers’ pork, flour, potatoes, or clothing—an exchange that would be ruinous over time. While Indigenous food systems were being dismantled, elsewhere in the world food itself began to change. From the early eighteenth to the mid-twentieth century, industrial production, preservation science, manufacturing, marketing, and the hospitality industries transformed the way people ate. This is the period that gave us the refrigerator and the gas stove, food-safety regulations, canning, and frozen dinners. At this same transformative moment in history, Canada’s government engaged in a concentrated effort to eradicate Indigenous peoples and their cultures, including by squelching language, self-government, land use, and hunting rights. Indigenous food practices were excluded as most of the world’s food practices modernized and commercialized (not always for the better), and most Indigenous people were forced to rely on processed and expensive provisions. Indigenous food sovereignty was decimated by design. It was not a side effect of colonialism but a function of it. Over a century later, food insecurity—inadequate access to affordable, safe, nutritious food, resulting in negative physical-, mental-, and social-health outcomes—is far more common among Indigenous people throughout Canada than in the population of the country overall. Forced to transition over generations to a Western diet, which many Indigenous communities cannot necessarily access or afford, First Nations people, Inuit, and Métis people suffer higher rates of diabetes and cardiovascular-health issues as a result. The social and spiritual losses are far more difficult to measure. In northern Canada, supermarket staples, which generally need to be flown in, often cost double what they do in southern urban areas. The federal government began subsidizing the price of shipping food to northern communities in the late 1960s through Canada Post’s Northern Air Stage Program, ostensibly to increase residents’ access to healthy food. In 2011, the program was replaced by one called Nutrition North, in which select vendors receive subsidies for shipping food to the area; the intentions were to increase consumer choice, lower prices, and make healthy produce more accessible. Instead, northern communities have received grapes for $28 a kilo and $9 boxes of Corn Flakes. The non-profit alliance Food Secure Canada says that while food insecurity in the North is well documented, there is no comprehensive analysis of exactly how prevalent it is. A study conducted by the University of Waterloo found that 70 percent of the population of Fort Albany First Nation in northern Ontario was food insecure; in a separate report, Food Secure Canada estimated that residents of that community would need to spend 56 percent of their income to purchase a basic nutritious diet. In addition to helping to provide access to a Western diet, LeBlanc says, the Canadian government should consider getting out of the way of Indigenous people’s ability to sustain their food practices. The issue isn’t figuring out how to lower the cost of a box of Corn Flakes—it’s thinking that Corn Flakes ever represented a good solution in the first place. 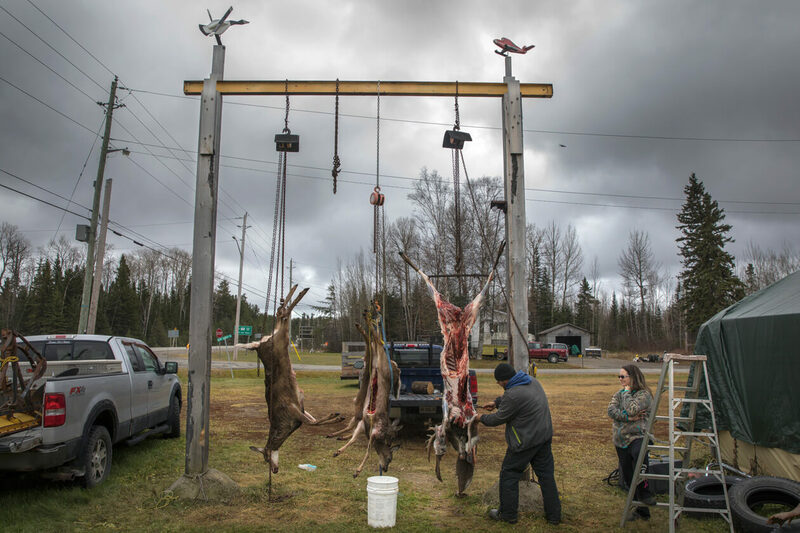 Chris Ruth prepares a deer carcass at a community hitching post. Bell had a father, grandfather, and uncles who taught him to hunt, and he’s one of very few in his community who are able to source food in this way. Some of his friends did not have a chance to learn hunting as teenagers, as he did. Others don’t have the means. Bell’s truck, which he needs to make it over the unpaved roads, cost more than his house, and it can be $150 in gas just to get up to the hunting area. He spent at least $2,700 on the moose hunt last season. Even where Indigenous communities have managed to retain some of their food practices, legal obstructions and environmental threats make them difficult to sustain. In theory, the Canadian government is constitutionally required to consult with Indigenous communities when contemplating decisions that may adversely impact treaty rights. In actuality, this is a contentious and frequently litigated issue. In many parts of Canada, Indigenous people’s ability to hunt, fish, forage, and farm is compromised by the degradation of land and water through industrial-scale resource extraction. In other places—often described as “protected”—such as national parks, these activities are frequently prohibited by law. The formation of Canada’s parks, seen by many non-Indigenous people as wildlife refuges where nature is safe from human threat, has long disrupted Indigenous food sovereignty. Canada’s first national park, Banff, “was predicated on the displacement of diverse Indigenous communities,” says Courtney Mason, author of Spirits of the Rockies: Reasserting an Indigenous Presence in Banff National Park. “This was facilitated by park management and supported by the police, missionaries, and tourism entrepreneurs. In part, they were attempting to curb Indigenous subsistence practices of hunting, fishing and gathering, in order to protect emerging sport hunting and fishing tourism economies operating inside the park.” Further development of Canadian parks was largely modelled after Banff, incurring similar displacement and cultural damage. It remains illegal for Indigenous people to hunt in about half of the country’s national parks. Even where it is possible to hunt, with a few exceptions, wild meat cannot be sold in restaurants, butcher shops, or grocery stores in Canada. This means hunters cannot earn a living from their efforts, and many Indigenous foods cannot be shared in retail or commercial settings beyond reserves or special, limited-licence events. Many coastal communities face a similar challenge as, even while living off of seal meat, the European Union’s ban on seal imports has made it impossible for families to earn revenue from the sale of skins. There are also small signs of hope. About twenty-five years ago in northwestern Ontario, Rainy River First Nations (an amalgamation of seven historical Saulteaux bands), began a successful project to rehabilitate their sturgeon stocks: the population of the fish, which can grow up to 400 pounds, had dwindled due to overharvesting and pollution. In the last two years, Rainy River First Nations donated nearly thirty juvenile sturgeon to Ochiichagwe’Babigo’Ining Ojibway Nation, which has partnered with the Ontario Ministry of Natural Resources and Forestry and Ontario Power Generation to reintroduce the fish into the Winnipeg River. There are other examples, but they are scattered; larger-scale change will require a more basic reexamination of how land is managed across Canada. It has been twelve hours out in the bush, and the sun is setting; Mark Bell has eaten a ham-and-cheese sandwich and used a tank of gas, and nothing has crossed his field of vision except a rabbit and a fox. A hunter is never guaranteed anything. Last year, Bell spent seven days out here without even seeing a moose. If he takes one now, that will be it for the year—he doesn’t need any more. (Bell will shoot any additional moose he sees on the road, though, and give the meat to elders.) Likewise for beaver, which he does not like eating (though he’ll use it as bait for trapping pine martens), and lynx, which his wife doesn’t want him cooking in the house. Kantola is mostly vegetarian; she likes wild meat but isn’t thrilled at how much time her husband spends up here while she is alone with their two-year-old. Back in Nakina that night, he eats a bowl of moose chili with macaroni, watches a little hockey, and goes to bed on the sofa so he won’t wake Kantola and Taiga when he gets up early again the next morning. The chest freezer downstairs still has a few meals’ worth of moose left, in addition to other country foods—wild blueberries, walleye, speckled trout. But they are nearing the end of their supply. In the interior of BC, nestled in the Fraser Canyon region, sits Xaxli’p territory—green hills covered in fir and pine trees, sitting in the shadow of snow-capped mountains and one of eleven communities that make up the St’át’imc First Nation. Over the course of decades, the clear-cutting taking place in the surrounding areas has destabilized the ecosystem, substantially disrupting traditional food supplies. In the 1970s, hunters started spotting moose less and less frequently. Soon, the people found other forest foods essential to their lives—deer, wild sunflowers, cow parsnip—disappearing as well. LeBlanc says there is a legal basis for implementing more food-oriented policies. This means, for instance, reforming training for forest-management authorities to include Indigenous world views and rights. In forested areas like the Fraser River canyon there is an alternative, which he and many others advocate for: community-based forestry, in which land is managed by and for the people who live on it. “Community forestry is a movement that started in Nepal in the seventies,” says Susan Mulkey, communications manager for the BC Community Forest Association, “where the government recognized that degraded land, the best stewards of that, the best people to bring it back to productivity, are the communities themselves.” The idea, LeBlanc says, isn’t to reject industry outright but to take an approach that incorporates economic and employment interests without excluding the use of land as a food source. In the late 1990s, BC began a pilot project for community-based forest management; it now includes over sixty community forests that produce just under 3 percent of the provincial timber harvest. In 2011, following decades of protracted conflict with the government and logging companies, the Xaxli’p reached an interim compromise: the Xaxli’p Community Forest Corporation they had established a few years earlier was given a twenty-five-year tenure over the trees in most, but not all, of their territory. (Prior to that agreement, the province had given a number of companies the right to harvest timber on Xaxli’p land.) Restoring the land and creating a sustainable economy are goals that are built into XCFC‘s corporate mission. The plan is to eventually harvest timber in sustainable quantities and using sustainable methods. “Our long-term goal is that our community forest will be self-sufficient,” says Nora Billy, a member of the XCFC board of directors. The XCFC plans to balance the conservation mandate with value-added timber harvesting, manufacturing products for sale in addition to selling raw logs. The first step has been ecocultural restoration. This includes promoting moose habitat by removing planted pine trees (to encourage the growth of willow and other wetland shrubs), leaving old fallen trees intact for animal habitat, purifying water, and thinning forest areas that have grown too dense due to post-logging replanting and government fire-suppression techniques. Moose and deer have begun returning to the area. Mark Bell is on the lookout for moose. More than 4,000 kilometres east of Xaxli’p territory, Charlotte Wolfrey spends her weekends fishing and hunting outside of Rigolet, on the coast of Labrador. Over a spring weekend, the retired environmental researcher and current AngajukKâk (mayor) of Rigolet caught eight Arctic char, each one weighing about five pounds, and spent a few hours smoking the fish in a homemade apparatus constructed with wood and chicken wire. She also picks fruit—bakeapples, crowberries, partridgeberries—eating it fresh for a couple weeks before freezing the remainder for the winter. In the fall, she hunts geese and duck, then beaver, lynx, and fox as it gets colder. She estimates that as much as 70 percent of her diet comes from fishing, hunting, and foraging wild foods; the most important source of all is seal. In a large city, food choices are horizontal, like a buffet, each option available independently of the others. In many Indigenous food systems, the menu is much more vertical, like a Jenga tower, in which many pieces support the entire structure; removing one element can topple everything. Within this food system, an animal like seal is not just a source of protein but also of fuel, clothing, tools, and commerce—all of it devastated in 2009, when the European Union, prompted by environmental activists, banned the import of seal products. One of the major organizations that protested sealing was Greenpeace; since the ban was instituted, it has acknowledged and apologized for its role in campaigning against sealing and in particular its failure to distinguish between the commercial industry and Indigenous traditional practices. In the wake of that acknowledgement, the EU granted exemptions from the ban to Inuit communities in Nunavut and to Inuvialuit in the Northwest Territories. But, for many, this was too late to make a difference: after the EU ban, the price of seal pelts dropped from $105 to $15. And because it was often Inuit and First Nations who were engaged in the commercial seal hunt—there isn’t a neat divide between “traditional” and “commercial” use—when the market evaporated, so did the ability of Rigolet and other Inuit and First Nations communities to earn revenue through this core part of their culture. In front of the stove at his restaurant—Kū-Kŭm Kitchen, in an affluent midtown Toronto neighbourhood—Shawana has a tray of seal loin divided into four-ounce portions. Cranking the gas flame, Shawana ladles a generous glug of ghee into a small pan and gently lays the meat down. After he has seared a crust on each side, he sets the meat on a cutting board to rest, then slices it into strips, plating it with wedges of roasted beet, caribou moss, and a drizzle of sweetgrass-infused oil. The meat has the character of a slightly chewy cut of beef crossed with the iron-rich minerality of liver. Shawana is Odawa and (like LeBlanc) grew up in Wiikwemkoong Unceded Territory on Manitoulin Island. There are no seals around Lake Huron. “I never ate seal until a year and a half ago,” he says. When he was ten, Shawana started to learn hunting, butchery, and fishing from his uncles. He foraged in the wilderness with friends, pulling the bark back on cedar and eating the membrane and chewing on a liquorice-tasting purple root they called “Indian candy” (one of several foods given that name, which also often refers to candied salmon). A few months after the restaurant opened, Shawana learned that a petition was circulating to demand he take seal off the menu. This was followed by a counterpetition and ignited a series of media stories about Kū-Kŭm, shifting the focus from alleged animal cruelty to a discussion about the importance of seal in many communities and the history of misunderstanding by environmental and animal-rights activists. Shawana’s reservation book filled up, and soon the thirty-seat restaurant was packed—people were coming to eat not just seal but pemmican, venison, and pine-needle sorbet. Shawana now has his sights set on a legal obstacle to the preservation of Indigenous cuisines: the limits on selling hunted game meat. The elk, bison, and boar that have appeared on his restaurant’s menu have been farmed. “I’ve been trying to get enough balls to serve wild game in here,” says Shawana, “and to see what the repercussions would be. If they close us down, they close us down.” (He is now in talks with the provincial government to secure permission to sell wild game.) Serving actual game would allow Shawana to present a more authentic version of the cultures he is representing and create a vital revenue stream for Indigenous hunters—a way for urban centres to not just be ambassadors but contribute financially to the restoration of food systems. On the second morning of Mark Bell’s moose hunt, he gets up at six, eats a bowl of instant oatmeal, and loads his gear. He waits until he arrives at the entrance to the bush road to offer tobacco (itself another example of a First Nations agricultural product that is now bound up with many regulations) this time emptying out a whole cigarette instead of just a pinch. Despite an outward ambivalence, he is starting to fidget, compulsively scanning radio stations and fiddling with a rifle magazine with one hand while steering with the other, his thumb caressing one of the copper-tipped cartridges. Joseph LeBlanc has long believed that there are many more Indigenous people wanting to participate in traditional food activities like hunting than actually do so. To find out what was preventing them, he conducted a community food assessment in Sudbury that identified cost and knowledge as barriers to entry. In 2016, the community launched the Family Hunt Camp; in the fall, families are paired with elders and experienced hunters, who share their knowledge and lead people out on their first hunts. Participants learn not just how to safely operate a gun but about spirituality, philosophy, the relationship between animals and humans, and why you don’t shoot something that’s running away or doesn’t know you’re there (the animal is not offering its body, plus chances of a clean kill diminish with a moving target). New hunters can also help supply a food bank in downtown Sudbury, where people give tobacco in exchange for elk, deer, or moose meat. Corey Mintz has written for the Globe and Mail, the Toronto Star, and the New York Times.